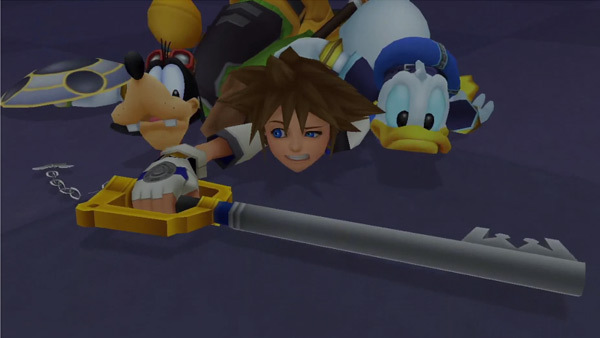 Considering that last year marked the 10th anniversary of Square Enix and Disney’s popular Kingdom Hearts franchise, there are probably quite a few younger gamers out there who have only been introduced to the series through its more recent handheld spinoff games, such as Kingdom Hearts: Birth By Sleep for the PSP and last year’s Kingdom Hearts 3D: Dream Drop Distance for the 3DS. Later this fall, they won’t have to resort to dusting off the old PlayStation 2 if they want to experience the first adventures series protagonist Sora took alongside Donald Duck and Goofy. The PlayStation 3-exclusive remastered collection Kingdom Hearts HD 1.5 ReMIX, recently released in Japan and confirmed for a fall release in North America and Europe, is here to fill the need for those wanting their Kingdom Hearts itch scratched. The collection will include the original PS2 Kingdom Hearts that started it all, Kingdom Hearts: Re: Chain of Memories, a polygonal PS2 remake of a Game Boy Advance title, and a collection of cutscenes retelling the story of the DS title Kingdom Hearts: 358/2 Days in full HD. All three of these will be fully remastered for widescreen high-definition gameplay and trophy support. Yes, even Days, as crazy as that may sound, will have trophies for watching everything. Previous trailers for HD 1.5 ReMIX have only been for Japanese audiences, but for the PAX East convention, Square Enix has whipped up a new trailer making use of the English version. You are welcome to watch below and get excited, marvel at the upgraded graphics, and remember the times when Haley Joel Osment, who has provided Sora’s voice from the start, still sounded like a kid. We will keep you updated on news regarding Kingdom Hearts HD 1.5 ReMIX, as well as the series as a whole and other Square Enix titles, as it is announced.